Blending fact and fiction, Colombiano is a heart-thumping journey into the violent and unpredictable world of post-Escobar Colombia. 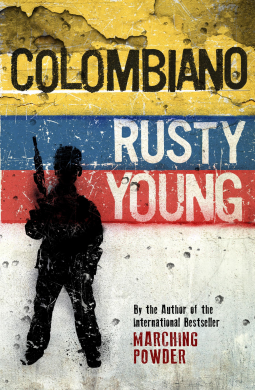 For four years Rusty Young worked secretly for the US government in Colombia. During this time he was shocked by the stories of child soldiers he encountered. He vowed that one day he would turn their tales into a book and let their voices be heard. All Pedro Gutiérrez cares about is fishing, playing pool and his girlfriend Camila’s promise to sleep with him on his sixteenth birthday. But his life is ripped apart when his father is callously executed in front of him by Guerrilla soldiers and he and his mother are banished from their farm. Vowing vengeance against the five men responsible, Pedro joins an illegal Paramilitary group with this best friend, Palillo, where he is trained to fight, kill and crush any sign of weakness. Rusty Young began his research for a non-fiction book about child soldiers but after interviewing a few he found that a better avenue would be to create a work of fiction weaving together the stories into a tale of one young boy Pedro. Pedro's life is changed when his father is murdered in front of him by Guerilla's who refuse to let him move or bury the body. In fact the whole town refuses to help Pedro so he swears revenge, joining an illegal paramilitary group to help him exact revenge of the men who were responsible. This is a long book but it is an interesting, and compelling read. Pedro is relateable and sympathetic as a character and if even a 10th of this book is real it is devastating. Colombian politics have always been unsettling but this really puts it in perspective. Each side saying they are fighting for the people and that the other faction is "bad" and the death toll mounts and the violence continues. The people stuck between all of this just keep trying to live their lives but sometimes not taking a side isn't as easy as you would think. When I thought of child soldiers I always think of those in Africa, stolen and drugged, forced to fight for whatever side abducted them but this is not that story. Here you are recruited, lured with promises of money and power. But what may have started out as a way to exact revenge or become more powerful quickly turns into a reality of violence, blind obedience and/or death. Well researched, well written and easy to read Colombiano is worth the time needed due to its length.